Napa Quake Mosaic at Napa Makes + Nimbus Arts! 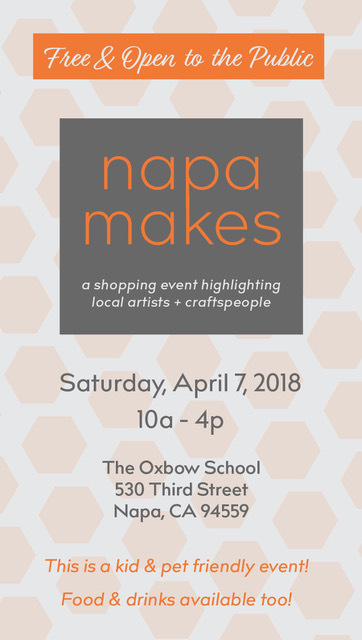 Join Napa Quake Mosaic and Nimbus Arts at this special event showcasing local artists + craftspeople! We'll have a family-friendly hands-on area where you can be a part of the mosaic making process. Enjoy the day and don't forget to get a ticket to the dinner supporting the scholarship program at The Oxbow School. You are invited to join us at Nimbus to contribute to the Quake Mosaic. These evenings will feature snacks, drinks and community spirit as we continue to build the mosaic off-site. No mosaic experience necessary. We will have all the tools and instruction available for you. Free and open to the public.